The majority of the grapes for the 1995 vintage came from the Martin Stelling Vineyard. The weather patterns were complex, unpredictable and yet perfect for the full ripening of the grapes, which had an unusually long hang time. This translates into full, rich, complex fruit which in turn made for a round, luscious, stellar wine. 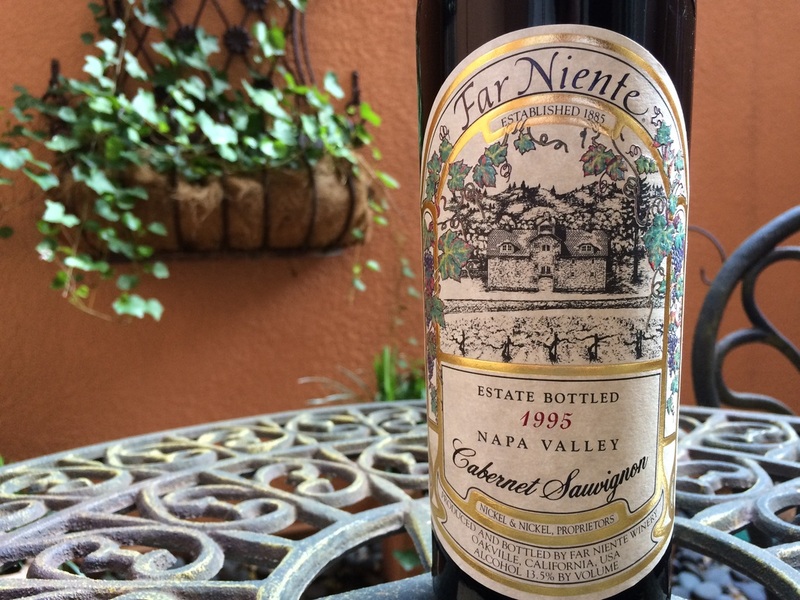 Far Niente has been a longtime favorite of the Bon Vivant Gourmets for its superior quality, intensity of flavors, terroir, age-ability, history, place in personal histories, and for being the wine that changed perspectives. 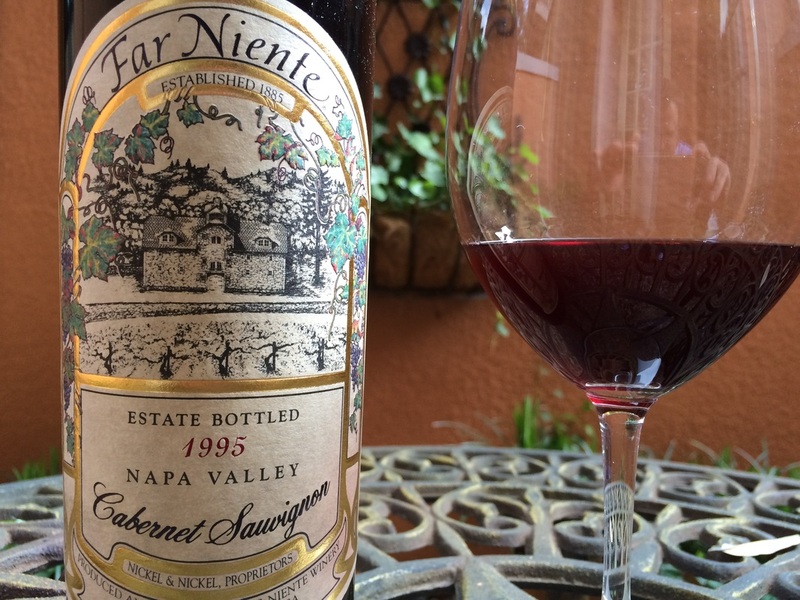 This tasting occurred in an outdoor garden patio setting with the sounds of a Spanish tri-tiered fountain flowing softly in the background and in Riedel Bordeaux Vinum stemware. The wine was open air for an hour and a half. 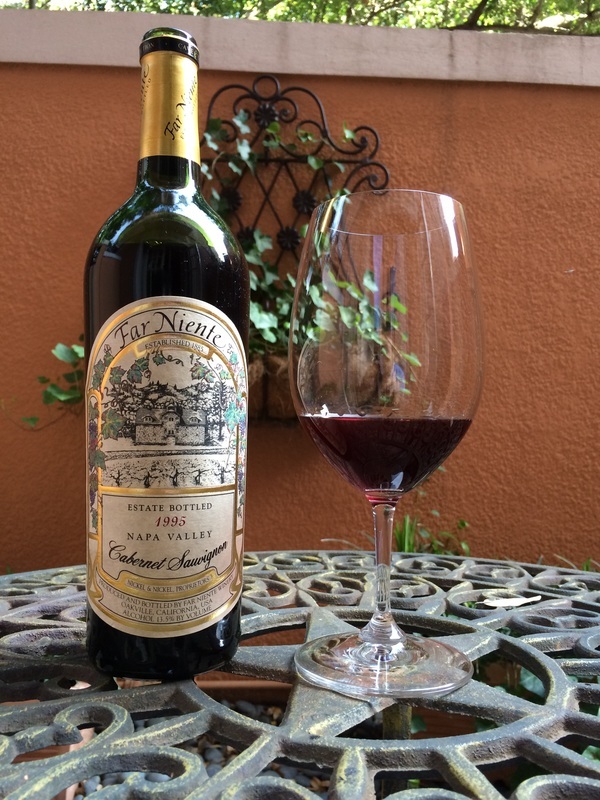 The 1995 is blended with Cabernet Sauvignon (81%), Cabernet Franc (14%), and Merlot (5%). 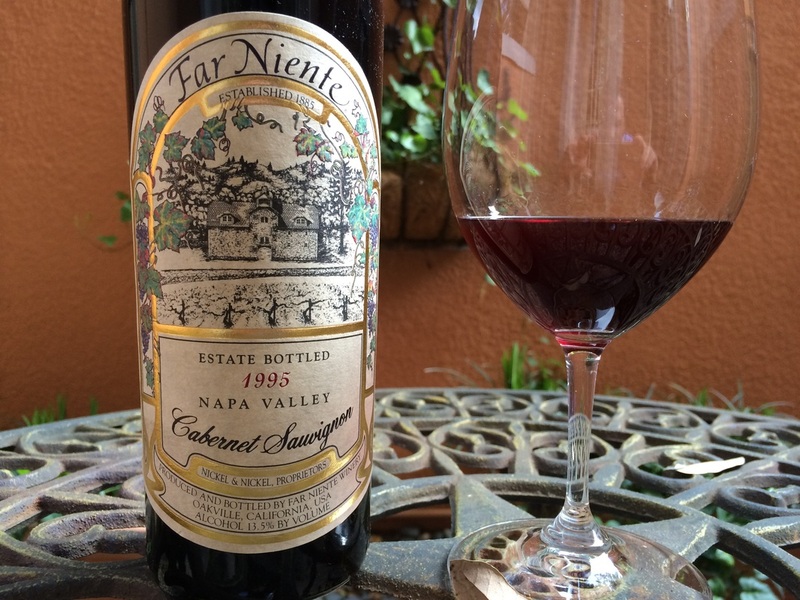 At a glance, the 1995 appears to have a cloudy hue, no doubt due to it's 20 years, yet still maintains a strong opaque crimson, maturing to an amber hue at its edge. 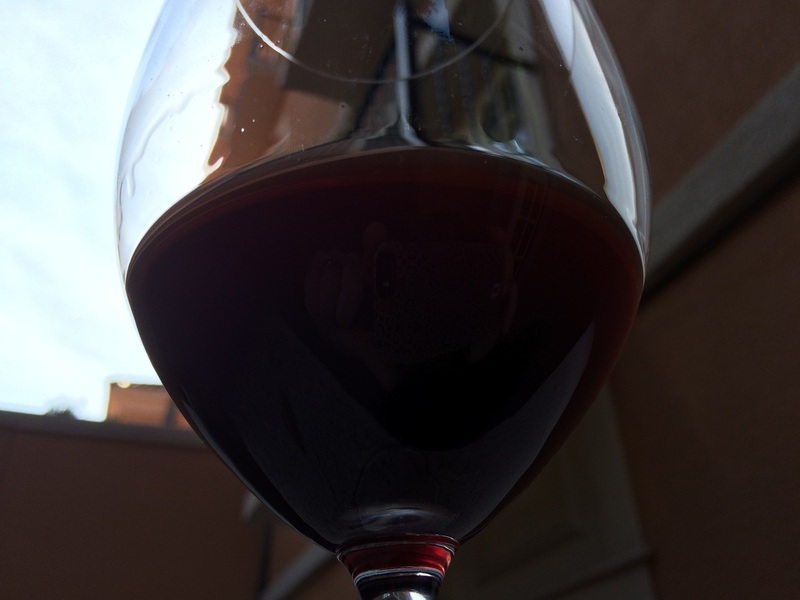 This may indicate a long and slow tannin integration and shows that the wine is still very healthy. After a few swirls and without approaching the rim, the area wafts with its freed bouquet (1), enveloping the senses and teasing desire. At the rim with another swirl, the soft, subtle essence of cedar appears: a remnant of 20 months in French oak barrels. This is followed by deeper, richer, and more complex bouquets (2) of chocolate rhubarb and hints of clove infused earth. There is also a hint of dried black Corinth consomme that seems to dance around the other elements. In its moment of fulfilled destiny, it feigns being medium bodied but exposes its fullness with delicate complexity and graceful elegance. The tannins are fully integrated; leaving nothing to prove their existence but the sensation of the most refined silk gliding effortlessly across the palate. A refined complexity of currant infused mocha, baked cherry rhubarb, clove spiced orange zest chutney, and dark Crimini mushroomed earth consume the entirety of the mouth and nasal cavity, thereby delighting the senses and opening the mind to a new understanding of what a wine can do in its maturity. Recommended Pairings: This wine requires something elegant and refined with infused sauces, consommés, or creams. Slow braised Boeuf Bourguignon, dry aged Kobe filet, or Canard à la presse with its traditional sauce would all pair splendidly. The Bon Vivants had this wine with an in-house dry aged New York strip with Bearnaise on the side: it worked but we also had the Chateau Gloria 1996 to help with the heavier, less refined, richer sauce.